TONTO NATIONAL FOREST – Nathan Rees and Beau, his German shorthaired pointer, took this reporter off-trail to hike along Dude Creek in Tonto National Forest, northeast of Phoenix. We were looking for an ephemeral stream: a channel that may be dry now but clearly carries water occasionally. 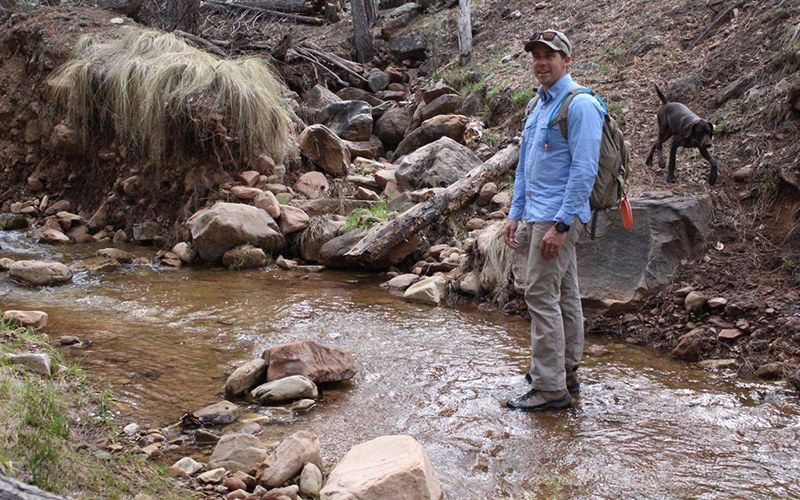 Rees works for the Arizona chapter of Trout Unlimited, the sportsman’s group. It favors federal protection over ephemeral streams, so industries would need a certain federal permit to build around them or discharge anything into them. Trout Unlimited says three-quarters of Arizona’s streams are classified as ephemeral, which in legal terms means waterways that flow in response to precipitation. “If there was a mining operation even a mile upstream from where the confluence is, and tailings are being dumped into this, you know, dry washbed, when those heavy rains come, it’s going to push all those tailings downstream,” Rees warned. Big Arizona waterways like the Salt River fall under the federal Clean Water Act, as do some of their tributaries. But exactly which tributaries are covered by the act has led to many legal fights since it was passed in 1972. Earlier this year, the Environmental Protection Agency and the Army Corps of Engineers said ephemeral streams do not fall under federal jurisdiction under the Clean Water Act. The proposed change would be from rules finalized by those same agencies in 2015 under the Obama administration. The public comment period on the change ends Monday. Sullivan said the Clean Water Act has a long and complicated history. The Obama rules came after a Supreme Court case from 2006 left no clear directive, giving each side of the issue a legal argument to make. After studying the issue, the Obama-era EPA and Army Corps of Engineers went with what Justice Anthony Kennedy had written in a separate opinion. “The idea that waters that have a ‘significant nexus’ with traditionally navigable waters should fall within the scope of the act,” Sullivan said. One example would be a wetland or desert wash whose hydrology significantly affected a more permanent waterway, even if the surface water in those wetlands or washes did not physically touch the main waterway. The Obama administration rule is unpopular with mining and development companies. Adam Hawkins, who consults for mining companies with the firm Global External Relations, said the 2015 rule only added “additional, unnecessary time and analysis to the process with, in my opinion, no additional protection to the environment” because other environmental laws also are in effect. EPA and Army Corps of Engineers officials under President Donald Trump are using a different, narrower definition of Waters of the U.S., this one from Justice Antonin Scalia. Ephemeral streams would not be covered under the current proposal. Spencer Kamps, with the Home Builders Association of Central Arizona, is happy with the proposed revision. Getting a federal permit under the Clean Water Act, Kamps said, can cost hundreds of thousands of dollars in engineering and legal services. And he added that having less federal oversight does not mean no oversight. In other words, the state can step in. The state is still finishing its comments on the proposed change, and the Department of Environmental Quality declined an interview. Melinda Kassen, an attorney with the Theodore Roosevelt Conservation Partnership, a sportsman group out of Colorado, does not see states filling the breach left by the federal government. She argued state Legislatures will be reluctant to pass any fee increases needed to improve regulation. “We have the Clean Water Act, in part, because the states had the authority to do this before and they weren’t getting the job done and the Cuyahoga River burned and other things happened,” she said. The Cuyahoga River in northeastern Ohio famously caught fire in the late 1960s, precipitating the Clean Water Act. Kassen also sees the Trump EPA as going further than a rollback of Obama administration rules in saying interstate waters – those that flow in two or more states – are not automatically considered under federal jurisdiction. “It’s a rollback of fundamental principles that have been on the books, in place, enforced, implemented since 1972,” she said.